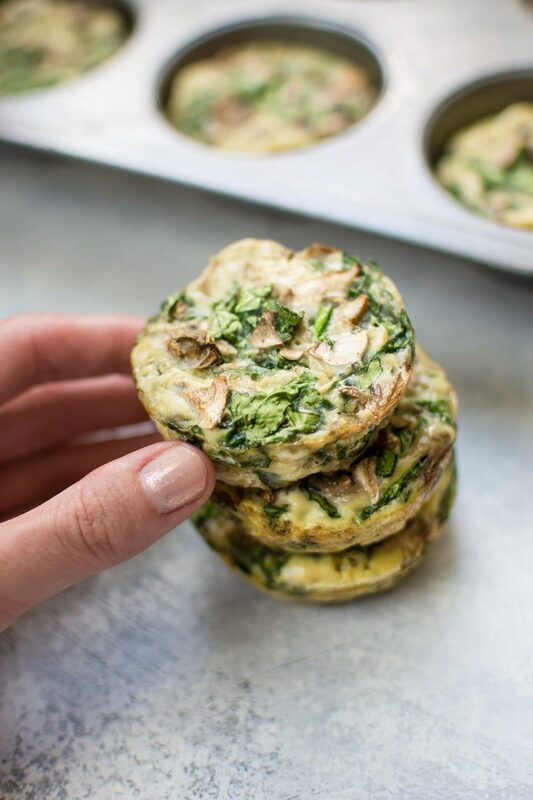 These healthy breakfast egg muffins with spinach and mushrooms are the perfect low-carb make-ahead breakfast recipe! Only 40 calories each. I’m all for cute little foods that are easy to make, and these low-carb breakfast egg muffins definitely fit the bill. They’re like little omelettes or frittatas that you bake in your muffin tin. I filled them with healthy spinach and mushrooms, seasonings, and a mix of egg and skim milk. There are plenty of these muffin tin eggs recipes out there, which shows that people really like them… so I wanted to make my own version. I wanted the recipe prep to be really quick, so there’s no sautéeing beforehand. Not that there’s anything wrong with that, but I wasn’t in the most patient mood the day I came up with this recipe (am I ever, though?!). The chopping is the most work you have to do here, and it’s not so bad. 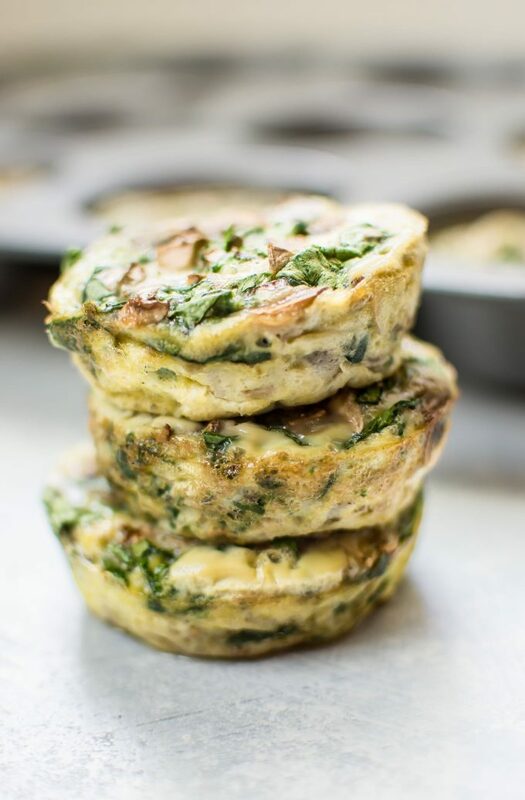 All you do to make these egg muffin cups is crack your eggs in a bowl, whisk them together with the milk, garlic powder, Italian seasoning, and salt & pepper, and then stir in the chopped mushrooms and spinach. You then spoon the mixture into your muffin pan and bake for 20 minutes. Pro tip: Make sure your muffin tin is well greased prior to adding the egg mixture. These baked egg cups should slide right out. I used Pam cooking spray and it worked great to keep the egg from sticking and hours of dishes. The mixture won’t fill each cavity in the muffin tin completely, which is good since they do expand. To warm these up, simply put them in the microwave for about 30 seconds. These will keep in the fridge for about 5 days in a tightly sealed container. Healthy breakfasts all week… done! They’re great for school, work, or a quick bite on the go. And at only 40 calories each, you can have a few of these protein-packed breakfast egg cups without worrying you’re overdoing it. Questions? Ask me in the comments! Preheat oven to 350F and move the rack to the middle of the oven. Grease a 12-muffin tin thoroughly (I used Pam cooking spray). In a medium mixing bowl, add the eggs, milk, Italian seasoning, garlic powder, and salt & pepper. Whisk together thoroughly. Chop the spinach and mushrooms, and stir them into the egg mixture. Spoon the egg mixture equally into each cavity of the muffin tin. You can eat the egg muffins warm, but make sure you let them cool thoroughly prior to storing them. They will keep in the fridge in an airtight container for up to 5 days. Like the spinach and mushroom combo? You may also like this gnocchi recipe. Looking for more fun breakfast ideas? Try my pumpkin pie breakfast popsicles. I love little breakfasts like this Natasha! So easy to make and so satisfying and quick! Um I’d love these. I eat breakfast sometimes. Deliver some to me now. The perfect make ahead breakfast! I love the mushroom and spinach combination here! These remind me of those little bites from Starbucks, but way better! These are the BEST for breakfast! These sound like a great way to start the day! Full of colour and flavour. This is just what I want for breakfast! love these muffins! and only 40 calories each?! WOW! Esses Muffins de ovos de café da manhã com espinafres e cogumelos saudáveis são super diferentes para mim mas parecem muito apetitosos vou adorar saboreá-los. They look divine. I’m wondering whether you used a mini muffin tin or a regular one. Just thinking thru on the quantity before I make them. Thanks! Yummm, just gunna add a little feta and use egg whites!! Sounds good to me!! Enjoy. OMG! egg muffins I have never ever thought about egg muffins. I am going to try this. These look delicious. I didn’t see the nutrition info except the calorie count. How many carbs does the skim milk add? Hi, Lynn! I didn’t work out the full nutritional info, sorry about that. I don’t provide it for most of my recipes for various reasons. If you have a nutritional calculator you trust, try plugging the values in and see what it comes up with. Love these! Could I possibly add cooked ground turkey to this as well? If added would the egg muffins require a new cook time or oven temp? Hi Kaitlyn! I think that adding cooked turkey should work just fine. I’d keep the temp and cooking time the same to start with. I am a fan of spinach and mushroom in eggs and these are great. Just an FYI, I can’t have dairy so I added a 1/4 cup of soda water for nice puffy muffins. A good alternative if you need/want to cut the milk. Looking forward to tomorrow’s breakfast! These look great! Quick question is this the same recipe if I use a mini muffin tray, or do I need to change it? Also may I saute the mushrooms beforehand, and possibly the spinach too?